AMA-4251 Series Crossband Coupler used to diplex 800-900MHz AMPS/USDC & GSM with 1800MHz systems such as PCS, DCS 1800, PCS & 3G Next Generation Networks. 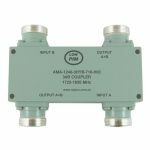 AMA-1296-20-SF 9.6GHz, 20dB Coupling value, IP65 Rated sealed box, SMA female connectorised, 200 Watt compact coupler. Rojone manufactures a range of Cellular frequency, standard and high isolation 3dB Hybrid couplers. Directional couplers are passive devices that couple part of the transmission power in a transmission line. These directional RF couplers change by a known amount out through another port. A typical RF directional coupler often uses two transmission lines set close enough together such that energy passing through one is coupled to the other. Pasternack directional RF couplers provide the bandwidth, high directivity and higher power at up to 60W that designers need for their most demanding applications from stock, max 5 working days delivery within Australia. Broadband Directional Couplers – SMA connectorisedbroadband & Octave ranging from 0.5GHz to 18GHz, various coupling values. Dual Directional Couplers – SMA Various coupling values 10, 20 & 30dB, Octave frequencies 0.5 to 18GHz. High Power Directional Couplers – 600 Watts CW, 10K Peak, 30dB Coupling, input & output connectors N Female, Coupled ports SMA Female.